The amount of time we spend in front of the television or the computer screen is extremely high. Teenagers nowadays spend half their day with their phones and tablets. Some may even watch movies or play video games with the lights switched off. 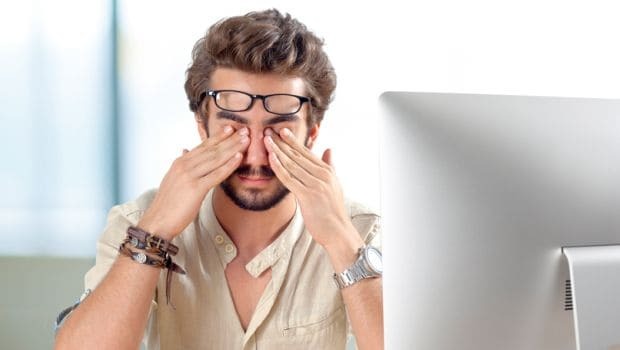 What they fail to understand is that they are putting a lot of stress on their eyes, which in the long run can lead to eye problems like watery eyes, cataract, etc. Another thing that people do incorrectly is reading. Doctors say that the ideal distance that a book or the computer screen should be from our eyes is about 40 - 50 cm. 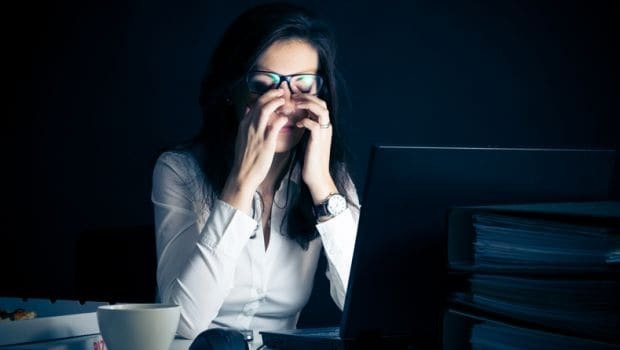 As indicated by a study done at the Ohio State University, eye strain comes about because of gazing at the screen for a long period of time and it can bring about feelings like fatigue, dryness, burning and aching eye muscles. According to Dr. Amit Saha, Ophthalmologist, Kolkata, blinking is vital because it spreads tears over the surface of the eye. If it stops, the corneal surface dries out. At the point when this happens, the cornea gets to be cloudy, bringing about "foggy" vision. The normal blink rate is around 20 times per minute but using a computer or watching the television can drop it to as low as 7 times. 1. Stand or sit comfortably. 2. Put your thumb 10 inches away from your face and concentrate on it . 3. Take a deep breath and concentrate on an object that is 10-20ft away. 4. Repeat by changing the focus between objects with every deep breath. 1. Sit comfortably in an upright position. 2. Look at the leftmost point without moving your head. Focus on the point for 5 seconds. 3. Return the eye to its normal resting position and blink a few times. 4. Now look at the rightmost point without moving your head and focus for 5 seconds. 5. Return to the normal position and blink again. 1. Sit comfortably and a take few deep breaths. 2. Lean your elbows on the desk or table. You could put a soft pillow-like material to avoid strain on your elbows. 3. Rub your palms together and warm them. 4. Close your eyes and cover them up with your palms. Your fingers should be on your forehead and bottom part of your palms should be touching be your cheekbones. 5. 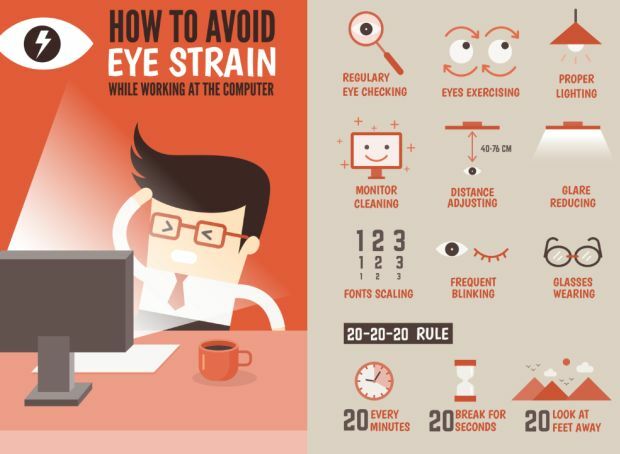 Avoid putting pressure on your eyes. To check, try blinking a few times. And be in this position for 5-10 minutes. 1. Close your eyes and press your upper eyelids lightly and gently massage in them in a circular motion with 3 fingers. Perform 10 clockwise movements and 10 anti-clockwise movements. 2. Use your fingertips to massage your temples in a circular motion too. Do this 20 times in a clockwise movement and 20 in an anti-clockwise movement. Comments3. Massage the point between the eyebrows. Repeat this 3 times. Just like your body needs rest, your eyes need rest too. These exercises are easy to do and can be done anywhere. Counter the ill-effects of over-exposure to screens with these easy exercises.